Sorrentino, T.; Masoller, C.; Soares, C.; Vidal, I.; Oria, M.
We report experimental and numerical investigations concerning semiconductor lasers emission under polarization-rotated feedback. We experimentally observe that for some semiconductor lasers the weak TM mode does lase even in the absence of TM feedback and we monitor how the TE and TM emissions evolve with the increase of the TM feedback strength. The emission frequency of a semiconductor laser subject to polarization-rotated feedback experiences a shift proportional to the optical power fed back into the laser. We aim to investigate what affects the sensibility of the frequency of semiconductor lasers to polarization-rotated feedback. Experimentally, we measured the proportionality coefficient β between frequency shift and feedback power for different lasers and characterized how it varies with some parameters. Theoretically, we made numerical calculations using a rate equation model, and our results show a critical dependence of the β coefficient on the gain self- and cross-saturation of both modes and the relations between these saturation coefficients. Sorrentino, T. [et al.]. 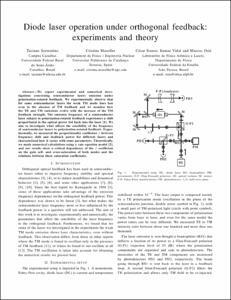 Diode laser operation under orthogonal feedback : experiments and theory. A: Workshop on Laser Dynamics and Nonlinear Photonics. "Fifth Rio de la Plata Workshop on Laser Dynamics and Nonlinear Photonics". Colonia del Sacramento: 2011, p. 1-3.